It's not often that planetary scenery that's a bit out of the ordinary comes up on Atomic Annie's itinerary, so it was a pleasant surprise to discover that our destination of Onatzala in G2 sported a set of fine planetary rings visible from the witchpoint beacon. I'd only ever encountered a ringed world on one previous occasion, but that last time was when the old Roj Blake was on a tight shipping schedule and I had no time for sight-seeing. This time Annie was carrying a hold full of non-contract cargo, so there would be plenty of time for a scenic trip to the rings! First things first though. I proceeded into Onatzala station on standard approach and docked, sending myself and the crew out for some R&R for a day or so before checking out the local market for some good value trading. 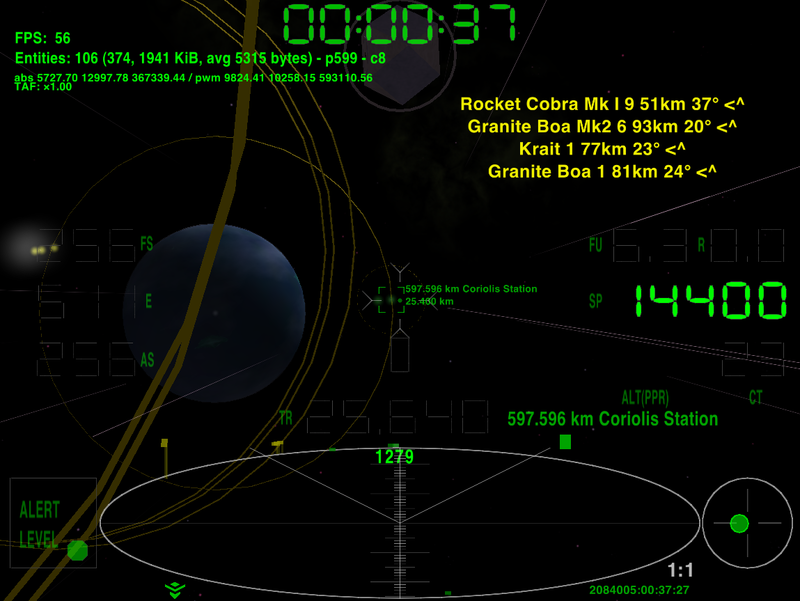 Annie was duly refuelled and loaded with more cargo, including a 500+kg Gold contract for Geisen, and after filing the usual flight plan documentation for a jump to Zaxarice we launched – turning towards the Roche-limit gap between the innermost Onatazalan ring and the planet itself instead of the standard departure trajectory towards the witchpoint beacon. We continued out towards the rings at full impulse speed – a lousy 0.14LM, slower than the launch speed of other ships from the station – and soon it became apparent that even though we'd cleared the station aegis the close proximity of Onatzala itself was mass-locking our torus drive. Still, at this point we weren't in a particular hurry, especially as with each passing minute the rings loomed larger and larger in the viewscreen with clumps of material gradually being distinguishable from the dust cloud as we drew closer. I adjusted Annie's course to keep us closer to the ring to stay out of Onatzala's atmosphere, praying to Giles that there wasn't some errant chunk of ice or rock from the ring edge that might blunder into our path. After a slow and somewhat leisurely journey we closed within a few kilometres of the rings, slowing on the final approach to take some photos of the ring formations. Atomic Annie gracefully passed through the ring gap with no incident, giving us a fine edge view of the rings before pulling up and away from the planet in preparation for our next jump, everyone taking picture after picture from the side and aft positions as we cleared the Roche-limit gap. All too soon it was back to work, that shipment of gold to Geisen wasn't going to shift itself! Last edited by Ranthe on Tue Dec 24, 2013 1:19 am, edited 1 time in total. Nice! I must revisit the nearest ringed planet again soon - Agebi, which is an unremarkable dump. Just read your Coyote story, Cody. Damn, but that nearly brought me to tears at the end. Very, very well done sir. Falcon777 wrote: Damn, but that nearly brought me to tears at the end. You did better than I, then..
Falcon777 wrote: Just read your Coyote story, Cody. Damn, but that nearly brought me to tears at the end. <grins> Good! I hope you enjoy the sequel, Inside Straight, too. Dropped into Leveti, a favourite haunt of mine, looking for some action. 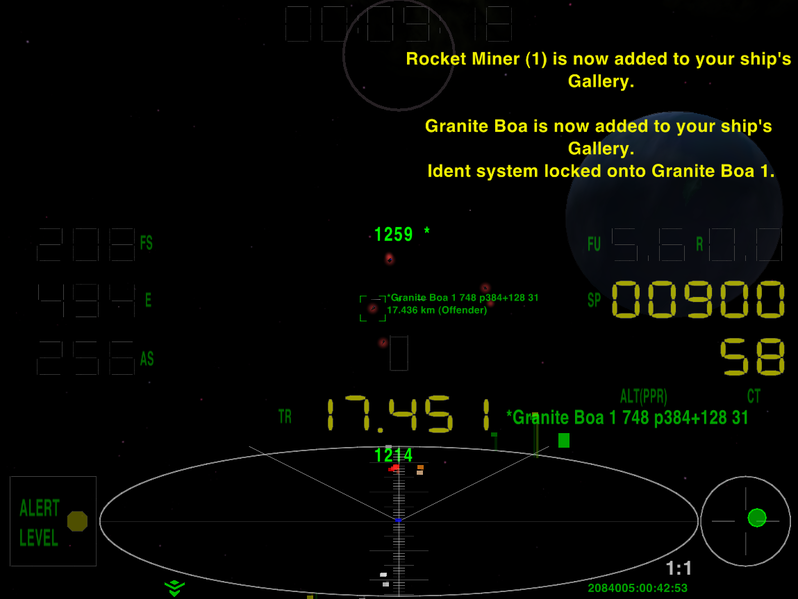 I'd had some new flight-control software installed back at Estiri, and Mercurial Amethyst was flying sweet. About halfway in, I got mass-locked by a pack of hunters - three Cobra IIIs and a Sidewinder - but they were no threat to me, as I run clean these days. Anyhow, an Asp MK II hove into view, with a fugitive status, so the hunters started their usual banter and the Asp headed out-system at best speed. I followed and tweaked his tail once, then settled into a long stern-chase, with the hunters following too. Slowly the Asp pulled away - and just as slowly, the Sidewinder began to overtake me, leaving his pals in the Cobras behind. But eventually the Sidewinder had to admit defeat and turn back. I carried on following the Asp with tiny bursts of the injectors to stay with him, and he began to get nervous, pleading for help - so I let him be, and headed for the aegis. There I was greeted by a nutter in a Hognose - and a mad miner. This pic says it all, really. I am deeply impressed by the NPC behaviour lately - and yes, some of it is crazy (or even wrong), but the 'lanes are alive, as is the aegis. Laughed at the storyline in your pic. Commander Mara spent some time giving Black Widow a new paint job (red-black, as fits the name) and further tweaking the settings of the ship's HUD. Having finally launched from Lave again, she decided to set course for Zaonce, and go further on to Isinor. Despite Isinor supposedly being safer than Lave, the first thing she did apart from sighting a beautiful asteroid field was run into two pirates. 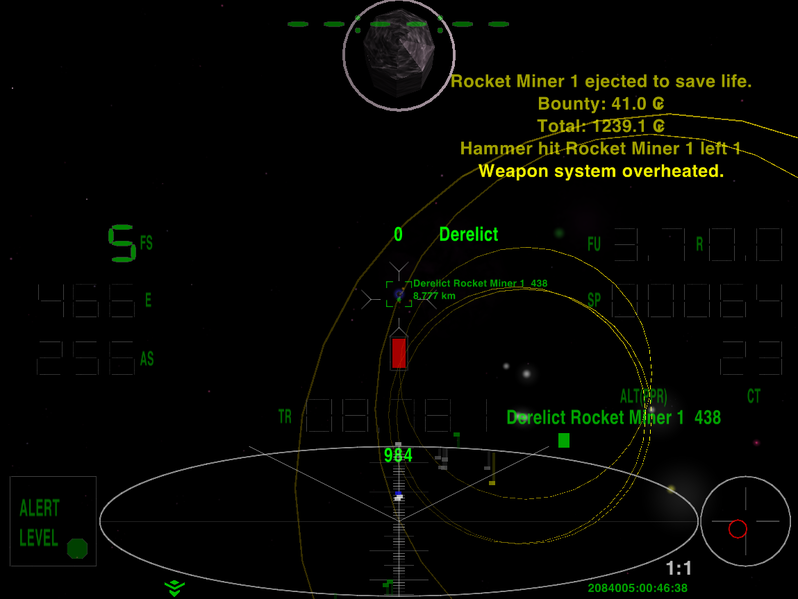 She made short work of them and even, by some miracle, managed to shoot down a missile (OOC: couldn't believe it). En route to Tionisla station, Mara decided to use a nifty piece of equipment called Ship Identifier - what a pity the ship examined was an oldie slow Python. Definitely not a ship she would like to buy in the future. For the foreseeable future, she will be making milk runs between Tionisla and Isinor to earn some money for a maintenance overhaul that Black Widow seems to require. ... to find that the lead ship was the Medical Anaconda Lambent Petunia III. Whew! Obviously her six Moray Medical Boat escorts had done their job sufficiently to deter the Corsair and Moray Star Boat from attacking, forcing them to look for easier prey, like a lone unescorted Anaconda. Unfortunately for them, ships like Atomic Annie can pack a fair punch in their defence! Usually I make OXPs only, but new things need to be tested before released and sometimes I stay in my ship longer than needed. I started from Lave and planned to test masslock borders (released here) over a long space lane in Riedquat. I got a pirate ambush of three ships in Diso, but this was an easy fight regardless of the many powerups on his ships. The leader Cobra Mk III succesfully arrived into the main station - behind me for recycling. I got a bit more than 1000 credits in total for bounties, escaped pilots and cargo from the towed Cobra. Another 2000 credits landed in my Salvager License pool, "only" 18000 credits left to get it. Then I take off without any rest to do my primary objective in the longest nearby lane just a jump away. After some back and forth flight between the station and witchpoint I knew by heart all ships in the lane, thanks to the visual sensors which show me not only the name and direction of ships from 2-4x scanner range but due to the new improvements now draw yellow circles around them also in green alert. Until I do not cross these I can fly safely without masslocks, no more travel far from the lane "for sure". I can zap forward almost as near as 1x scanner range from any ships, so my test was successful. 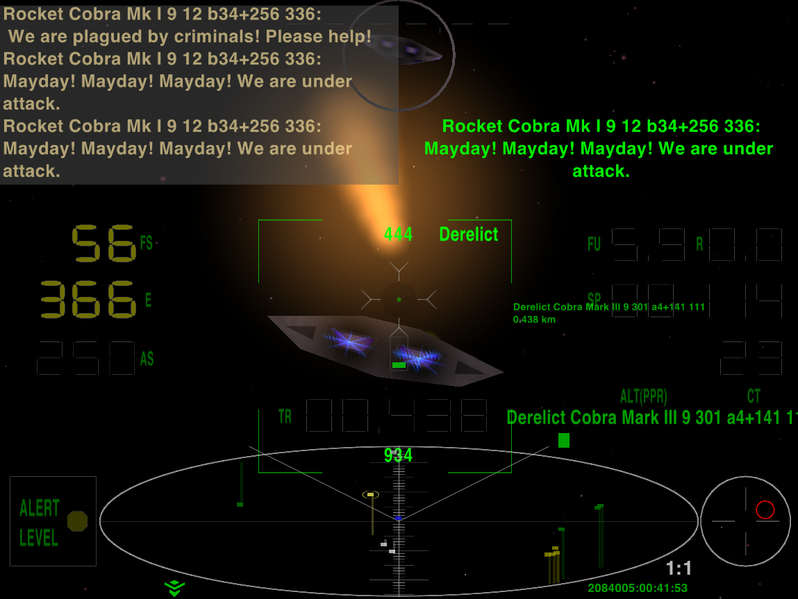 But at this point I encountered with the first combat in this lane: I got Mayday messages from a Cobra Mk I who has been attacked by an offender Cobra Mk III before my nose. After a minute my second salvage was ready to towing. The pilot of Mk I surely not the bravest in this system due to still keep crying for help long times after the attacker left his ship. I wished some thank you message instead but no problem, my loot was before me. I choosed the hard way to the station (in lane) where I found that the next well known ships before me is a large pirate group with many strong ships. No problem until my Injectors are working, moreover I got some awards into my ship gallery. Unfortunately a pirate is rode a similar ship than mine with exactly the same maximal speed and ignited his injectors also, so I was not able to run out from his masslock. I was not sure my fuel will be enough to arrive to the station so I tried to shoot down them with my aft laser during my run. Fortunately other pirates was not able to follow us. The next problem was my loot placed after my ship which served well as an extended shield for some time, but my pursuer managed to destroy it. No problem I said, then I will tow this pirate ship into the station. So I turned back - my turn rates are good again: with this Cobra in my back my ship was able to turn as an Anaconda only. My lasers was in heat more times than previously, but I managed a nice shot with my camera when I just forced him to use his insurance. My alert level turned back into green what I noticed immediately due to the appearing yellow circles. My fingers was well trained to quickly hit the snapshot key after this day. Finally I was not enough wise when I tried to pick up this ship with my towbar: I turned off my injectors too late and both ships was destroyed by the collision. Draw a lesson: improvements needed in the current auto-eject systems to get help in accidents also. Anyway, Atomic Annie launches, climbing out into the Orrore station departure lanes at a blistering (!) 0.14LM, and I notice on the scanner a convoy launching behind us. On a hunch I turn and follow them out - Hulda's Pig II, a fellow Anaconda, and her Cobra Mk1 escorts - and to my delight they open a wormhole to Cevera! Naturally I followed them through, arriving at the Cevera beacon with full Quirium tanks. It was fairly straightforward to locate Hulda's Pig II and form up again, and a course was set to the main station... when a group of unidentified blips at two o'clock on the scanner started rapidly closing on an intercept course. Given that we'd just received a warning that pirates were active in the area, there was little doubt as to what their intentions were, and our suspicions were confirmed in short order when the blips switched to red and the lead ship of the raiders opened up on us. Immediately Hulda's Pig II's escorts swung into action, launching themselves at the foe, and Atomic Annie followed suit. Already the old adage of "safety in numbers" was bearing fruit! Battle was joined, with Atomic Annie taking out the first raider - a Corsair, from memory - at long range with her forward military laser, and it wasn't long before the big Anaconda, Hulda's Pig II's escorts, and half the bounty-hunters in the sector were mixing it up in close quarter fighting with the presuably horribly surprised pirates. With so many ships in the fight it was hard to keep track of friend and foe, and more than once I had to break missile lock on a friendly Cobra Mk1 and search for a hostile, automatically hitting the ECM every time a missile launch was detected. A Pitbull was quickly forced to run from Annie's forward laser, and as I swung around looking for a new target - briefly glimpsing Hulda's Pig II running for her life away from the fray - a Python with Fugitive status suddenly blundered right in Atomic Annie's path. Immediately I yanked the Anaconda's throttles back, dropping engine power to minimum in a desperate attempt to avoid a collision while simultaneously manoevering to lock on to the Python who was already trying to avoid laser fire from at least two other ships. I was so close to the Python that her blip on the scanner was right on top of me, and Annie was automatically scooping up alloy shrapnel blasted off by the Python's attackers. Eventually I managed to open the range up somewhat to get a clear shot, and despite the laser thermal cut-out tripping every couple of minutes Atomic Annie finally took out the Python with her forward laser. I can't remember much of the rest of the battle, but when the firing stopped and dozens of yellow-tagged ships were semi-aimlessly milling about in The Viper and Whistle's attendant asteroid field I found I had clocked up another six kills on my record. Of Hulda's Pig II there was no sign, having disappeared into deep space beyond the witchspace beacon during the fight, and her escorts were no doubt either looking for her or heading to The Viper and Whistle for repairs. So I resumed course to Cevera station, Annie having sustained little significant damage to her hull or systems, watching the clock counting down on my passenger contract as we cleared mass-lock and engaged torus drive. A short while later the Pitbull raider that Annie has seen off at the witchpoint beacon decided to have another go, mass-locking the Anaconda and coming about to intercept - but I got him first! The pilot managed to eject before their ship blew, so I picked up the escape capsule and brought it into Cevera station with no further incident. Turns out the Pitbull pilot was one Xesteser Abma, a bug-eyed lizard from Isbeus, and she managed to persuade the Ceveran authorities to wipe her offender status with part of the insurance payout. Typical - but what else can you expect in an Anarch system! Still, I got over 200 creds for the pickup, and with Thesbi Atheifer and the three hundred-odd TC of radioactives safely delivered I now had a bank balance of over 700K. Now, do I put Atomic Annie through a much-needed maintenance overhaul (including permanent repairs to her hull plates), of risk her holding together without it until my contract to Ceoned is delivered...? I always thoroughly enjoy the adventures of Atomic Annie and her intrepid crew! Cody wrote: Pride goeth before a fall… there I was, in a nasty little firefight in some anarchy system. I splashed four of the five bandits, taking damage and losing the fore shield, and then set about the last one, who lobbed a hardhead at me just before he blew. 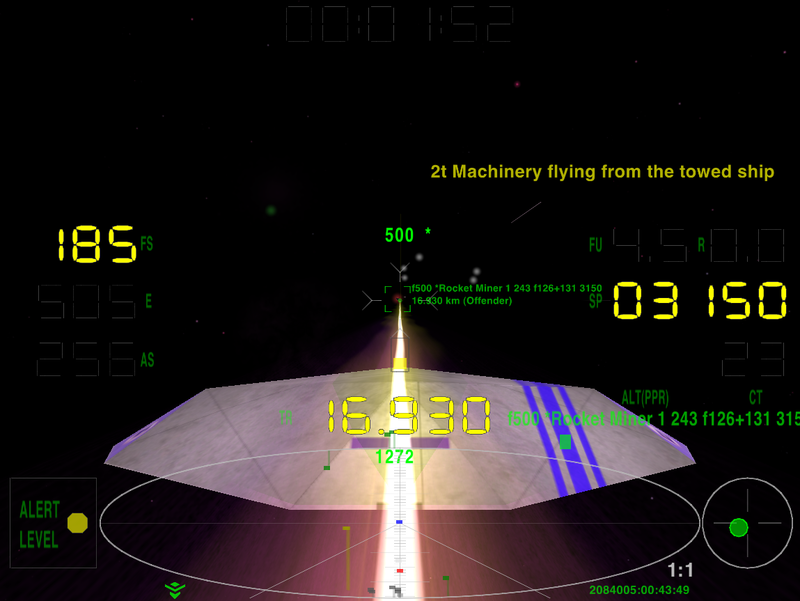 Somehow, I managed to pick it off with the near-overheated fore laser… so pleased was I with myself at this feat of marksmanship, that I failed to notice the second missile, tracking-in right behind the first, until it was far too late… press space, commander! Same happened to me an hour ago (Earth time). Swimming in glory visualising the pats on the back and lethal brandy's in the docking station...BANG. Attitude Adjustment? I'm too old for an ASBO! There's always the Oolite chatroom (irc) although it can be a bit quiet there at times. More 'chatters' needed! Smivs wrote: There's always the Oolite chatroom (irc) although it can be a bit quiet there at times. More 'chatters' needed! Well, it doesn't help that most of you are living on the wrong side of the planet!